If you’ve been using the cloud-based Xero system and running an existing payroll outside of Xero, or you’re looking to employ people for your small business in Australia, then this In A Day book is the resource you need. This book navigates through the payroll basics, and explains how to define payroll settings and set up employees. 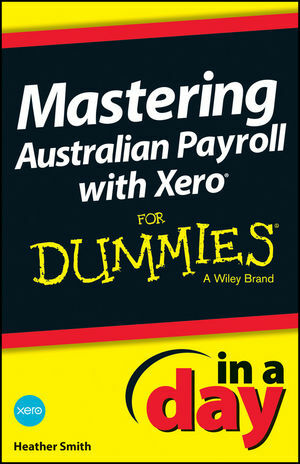 Mastering Australian Payroll with Xero In A Day For Dummies shows you how to define employee pay template settings, and helps you master some of the more advanced payroll functions in Xero. Employment expense is a significant chunk of outgoings for many businesses, so you want to make sure that you’ve covered all your bases, and that you’re meeting all of the relevant Australian compliance obligations. With this resource handy, you’ll be confidently processing payroll in Xero in no time — in fact, you’ll be there in just one day! Heather Smith is an accounting consultant who specialises in management report development, data detox, and cloud suitability scoping services. Heather remotely assists global businesses advising on process automation and maximising integrated data opportunities. A business and tech writer, Heather hosts the popular Cloud Stories podcast. She is an advisory board member for many dynamic businesses.